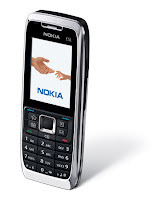 Nokia has unveiled last Tuesday the latest addition to its Nokia Eseries line, the Nokia E51. The Nokia E51 sports a classic stainless steel design and is packed with productivity applications suited for businessmen. Specifications of the Nokia E51 includes: Quad band GSM technology and compatible with WCDMA 850 and 2100 networks, 2 inch display, 2 mega pixel camera with 4x digital zoom, 130 MB of internal memory expandable with a microSD card, Bluetooth 2.0 with A2DP profile, FM radio and built-in Wireless LAN. Nokia stated that the Nokia E51 will be available during the fourth quarter of the year and will have a price of about 350 Euros.